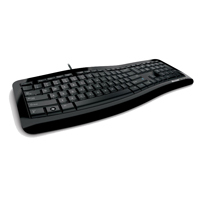 The Comfort Curve 3000 Keyboard from Microsoft is a simple yet elegant curved keyboard which helps keep your wrist in a more natural posture. All keys are the same size, and includes easy-to-access media keys for music and videos. A discrete numeric keypad is positioned on the right side for those who enter numbers often. This is identical to the TruForm PRO with the removal of the touchpad. 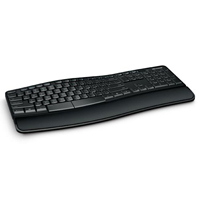 The Sculpt Comfort Keyboard from Microsoft is very similar to the Comfort Curve 3000 Keyboard but is wireless. The shape of the Sculpt Comfort has a higher degree of tenting, which helps keep your wrists and forearms in a more natural posture. 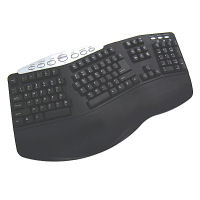 This higher degree of tenting shortens the actual footprint of the keyboard by 3/4" compared to the Comfort Curve 3000. All keys are the same size, with easy-to-access media keys for music and videos (these keys have moved from above the numeric keypad on the Comfort Curve to the F1-F4 keys on the Sculpt Comfort). 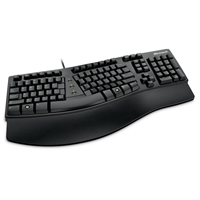 There is also a split spacebar with backspace functionality, detachable cushioned palm rests, and two legs in the front (rather than the back on most keyboards) to give a negative incline. Le Sculpt Comfort Keyboard par Microsoft est très semblable au Comfort Curve 3000 Keyboard , saufe qu' il est sans fil. La forme du Sculpt Comfort a un degré de tente plus haute, qui en fait, aide aux poignets et aux avans bras d'être dans une position plus naturelle. Le degré de tente plus haute raccourcit l'empreinte du clavier par 3/4" comparer au Comfort Curve 3000. Tout clés sont de même grandeur, avec des clés média facilement accessibles pour la musique et video (ces clés sont bouger du haut du pavé numerique sur le Comfort Curve au clés F1-F4 sur le Sculpt Comfort). Il-y-a aussi la barre d'espace qui est séparer en deux avec la fonction de retour arrière, des repose poignets cousinées détachable, et deux pieds en avant du clavier (par oppose a l'arrière sur la majorité des claviers) qui vous donne l'inclinaison négative.